Sprouting is the process of changing a seed into a little plant and this brings a great change in the seed / bean / nut/ legume. Neutralizing phytic acid and thus it is easier to absorb calcium, magnesium, iron, copper, and zinc found in the seed. Aids Digestability – Sprouting will help break down fat, complex sugars. Remove gas effect of beans. 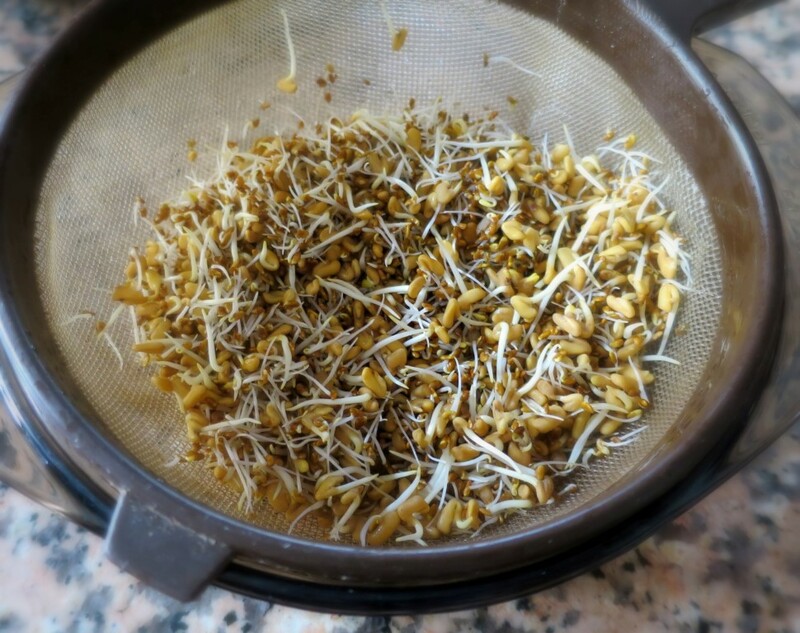 Sprouting increases vitamin B content. Sprouts are more alkalizing to the body. Put beans in water overnight. The next day, remove the beans from water and rinse again. Place beans in a damp tea towel and cover completely. Place towel in a pan/bowl and cover leaving in an undisturbed place. I keep them in the oven (switched off). Alternatively you could place the beans in a sieve hanging over a bowl and covered. Every day, or every four hours if it is hot weather, rinse the beans and store using the same method. If using a tea towel, make sure to rinse it as well. After four days, or two days if the weather is very warm, you will have sprouting similar to the below. You can leave for more days for longer sprouts depending on your preference. If you are happy with your sprouts, rinse them and store them in a closed container in the fridge. Check out this recipe for veggie balls using sprouted mung beans.